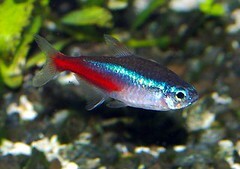 Ah the neon tetra (Paracheirodon innesi). My first fish. Who doesn’t like seeing a cloud of these little silver and red fish swimming slowly around the tank… until feeding time of course, then it’s every fish for himself. They can live up to five years or so in the home aquarium. Speaking of a home aquarium it’s best if the tank is 24 inches (60 cm) long or more. As a tropical fish you want to keep the temperature of the aquarium between 70-81°F (21–27°C) and a pH range of 6.0 to 7.8. If you test for KH then you want to keep it around 1.0-2.0. Neons are a timid fish and best not kept with more aggressive fish, or large fish that will eat them. Also they are a schooling fish and do best in groups of six or more. They feed mainly around the mid-tank level so you want to keep that in mind when feeding them with top tank feeders. If you have a heavily planted aquarium with subdued lighting then you have neon tetra heaven… or something like that. Other compatible fish companions are other tetras and guppies. Nothing too big, nothing too small… though I’m curious to see what you’d come up with for smaller than a neon. 🙂 In reality they can grow up to 1.2 inches (3 cm) but it’s always the smaller ones that are the cutest… for a fish anyhow. Neon tetras are omnivores and will eat flake foods, but make sure the flakes are small enough, so crunch them up with your fingers if not. Also to supplement their diet consider adding things like brine shrimp, daphnia, bloodworms (freeze-dried or frozen), tubifex worms or even tropical sinking pellets. Rumor has it that the tropical sinking pellets have natural color enhancers that will bring out the color in neon tetras, however I do not have confirmation on that. Males tend to be more slender and their blue line is straighter than the females. Females are rounder which produces a bent blue line. It is possible that some roundness can be from overeating, so don’t feed them too much. I personally have never tried to breed neon tetras, however what I am told is that you typically put them in a breeding tank with no light and gradually increase the lighting until spawning occurs. Mosquito larvae makes for a nice romantic dinner and keep the hardness of the water to less than 4 dGH. The adults can breed every two weeks or so, provided the environment is right. Some people have recommended letting the nitrates rise then doing an 50% water change to simulate the fresh rain tetras get in the wild. I don’t know if that matters to tank raised neons or not. Remove the eggs as soon as they are laid otherwise the parents will be having sushi for dinner when the fry hatch. The eggs will hatch within 24 hours and are sensitive to light. Feed the fry infusoria such as rotifers and egg yolk for one to four weeks and then switch to brine shrimp nauplii, shaved cattle liver and formulated diets. The fry should get their colors in about a month or so. There is a disease called Neon Tetra Disease (NTD) which is caused by Pleistophora hyphessobryconis. Though a well known condition it is not curable and is fatal. Neons can get it by eating microsporidian parasite spores from live foods such as tubifex, or from infected material such as dead fish. Symptoms include restlessness, loss of coloration (which can also be caused by stress), lumps on the body as cysts develope, trouble swimming, curved spines and secondary infections like fin rot and bloating. There is also a false neon disease which is a bacterial infection that shows similar symptoms. It’s impossible for the home aquarist to tell the difference from the symptoms. This disease has also been confused with columnaris which is better known as mouth rot or mouth fungus. There is no known cure, as I said, so really the only thing you can do is remove the poor little neon before it infects others. Also try to find a tank filter that will reduce the amount of free parasites in the water, such as a diatom filter. This entry was posted in Freshwater Fish, Freshwater Tropical and tagged freshwater fish care, neon tetras care guide, Tropical Fish Care.